When it comes to food, discipline, guilt, and calorie counting are words that fail to exist in my vocabulary. Over the years I have come to learn that dieting only leads me to eat more, abstinence only makes me hungrier, and...well, my greed knows no bounds. I would much rather drag my already damaged knees through 10-kilometer runs or damage my already frayed ligaments running after a small rubber ball in a squash court than hold back on a dish or, even more unthinkable, pass on dessert. Given my Catholic upbringing, it's nothing short of a miracle that I feel no guilt tucking into seven helpings of pan-fried foie gras at the Bar and Billiard Room's Sunday Brunch on top of close to 20 oysters and three trips to the dessert table. It's a simply a matter of mathematics, if you ask me: to keep from larding up, burn what you consume. Suffice it to say, I spend a lot of time burning. The same principle applies to the meals that I cook. Not one to watch what I eat, I certainly don't flinch at meals such as this one where the bright (at the time) idea struck me to allow the juices (read: melted lard) of this hunk of burnin' pork belly to drip unimpeded onto the bed of shredded cabbage (the other half leftover from the coleslaw), carrots and sliced potatoes that lay on the roasting tray beneath it. The recipe (if you can call it that) for this Pork Belly Boulangere was adapted from Gary Rhode's Keeping It Simple, where the skin of the pork is scored and then the entire piece of meat rubbed with coarse sea salt and pepper before roasting under the merest heat (160 degrees Celcius, to be exact) for three hours. 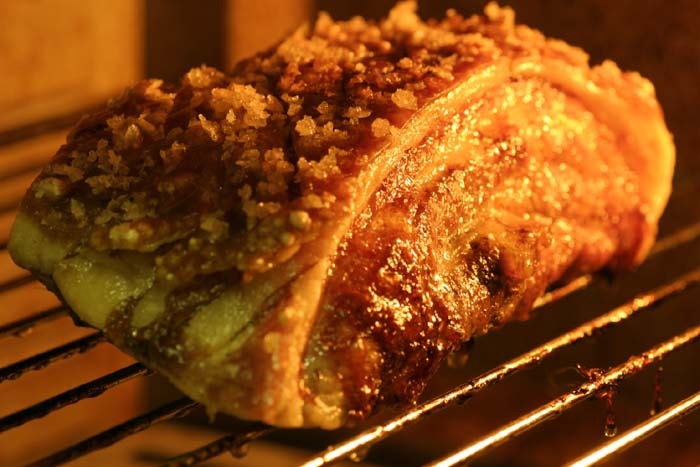 The resulting meat is buttery, succulent and über tender with a crunchy layer of crackling that would leave an Atkin's dieter drooling for its crunch. After the first hour of cooking, I slotted in the tray of cabbage, carrots and potatoes swimming in chicken stock which reduced to nothing but a tasty base in the heat of the oven. 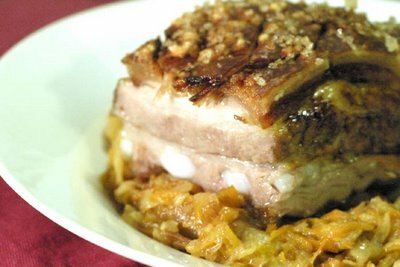 By the end of the cooking time, the vegetables were richly infused with pork fat -- waaayyy too rich, actually...even for my tastes. In went a quarter cup of cider vinegar to cut through the oiliness of the fat-soaked vegetables and that did the trick. Naturally, post meal C and I only managed to lay on the sofa, turning occasionally to pick up the remote. ahhaah, greedy, greedy, I think your philosphy is good. In France though you know, after a meal like this, we just have a nap under a cherry tree ;-) Great looking food! My arteries ache in sympathy, but my tastebuds are soooo jealous! We share the same food/running philosophy, Eggy. Which results in snug-fitting clothing when one can't run on account of a stubborn plantar fascia, such as mine. Still, I would snarf in this dish in a pinch! the things we do for a great meal! that's what motivates me onto the treadmill most mornings. that crackling sure looks good! I sold mine and got some extra cash! Oh oh Greedy Goose! This looks like my kind of meal! :) YUM!